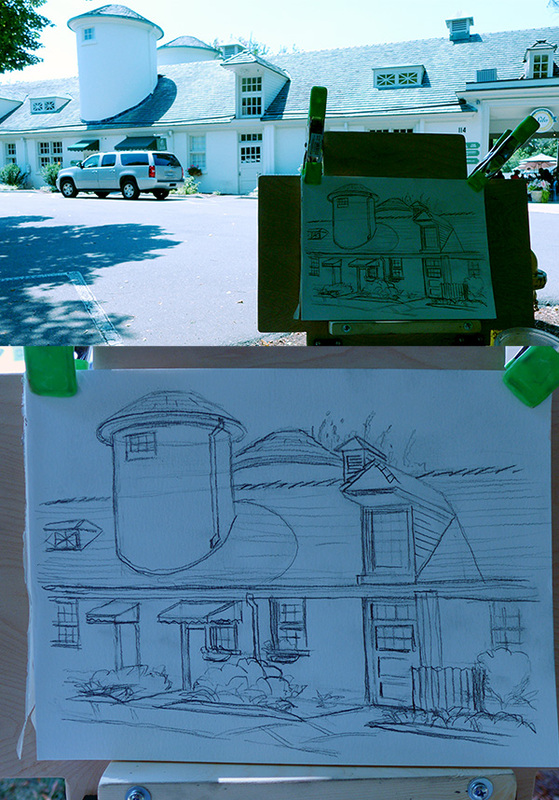 I spent a couple of hours today finishing up a sketch I made of the silo barns at Reynolda a couple of weeks ago. 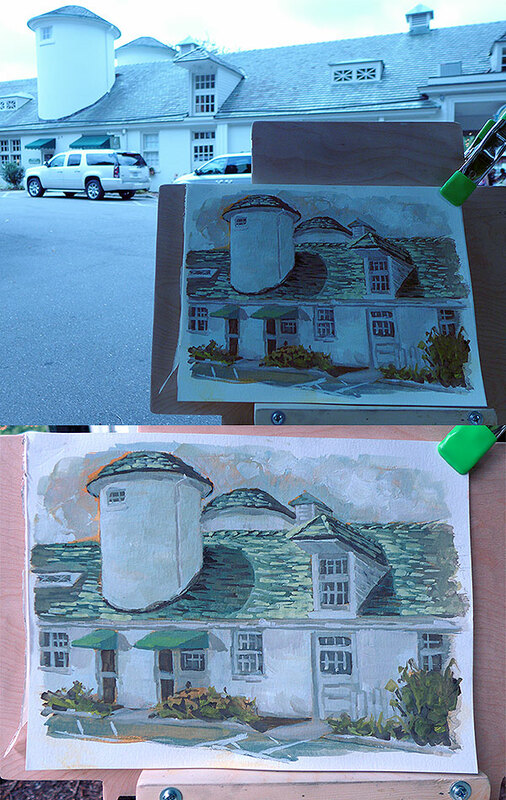 I decided to do it in two parts so I could have more time for both drawing and painting. If I try to draw and paint on the same day, I end up taking shortcuts. I only have a short amount of time to get away and do this after all. 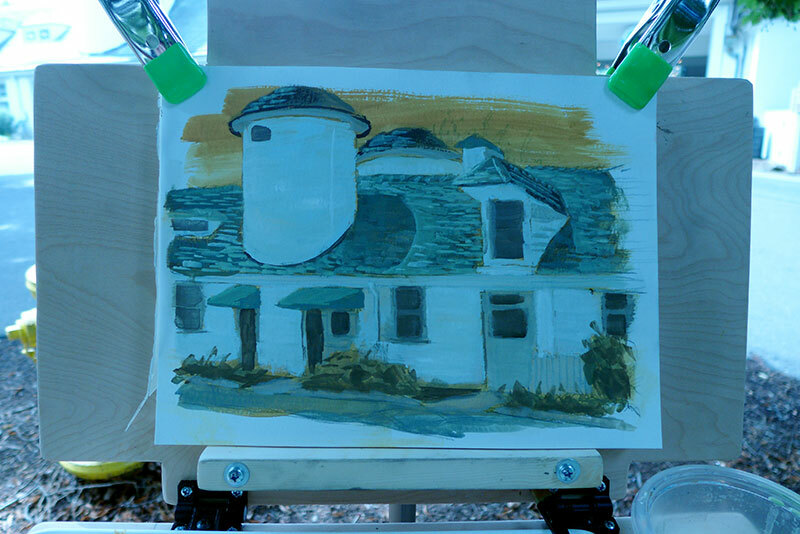 Anyway, I’m feeling more comfortable with the casein paint, although I am still searching for the right brushstrokes. I’m only using half inch flat brushes on this, so as not to get bogged down painting details. There is a ton you can do with just a half inch brush, but it does require quite a bit of finesse which I don’t feel I have just yet. I started with an orange wash and then quickly blocked in shapes. After that it was just a matter of building up the paint, paying attention to my mixing and trying to get the tones right. The sun was in and out, so it was a little difficult to pick up the exact shadows, but I feel like it’s starting to capture the light the way I want. This may have a bit to do with the fact that I changed two of my tube colors. I’m using a brighter yellow and red this time (cadmium yellow light and cadmium red scarlet). Not any red in this except for the underwash, but the greens are definitely brighter than what I was getting with golden ochre.